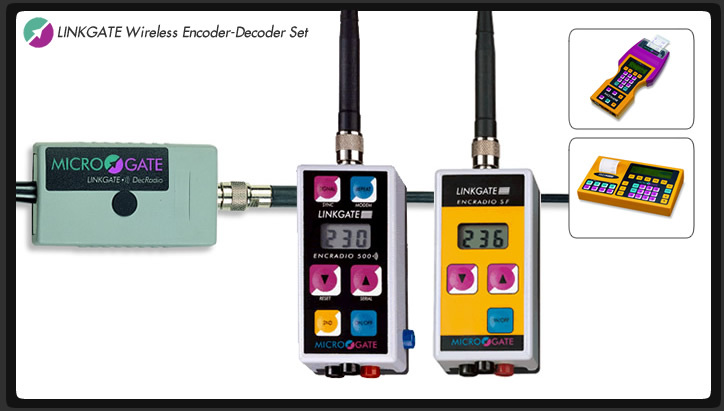 At the heart of Microgate's wireless technology is LINKGATE, the versatile radio transmission system that makes wireless timing a breeze. Simply connect the transmitter & receiver to any device with a normally-open contact (start gate, photocell, etc), and you're good to go. In impulse-mode (no bib number association) the LinkGate is fully compatible with ANY MANUFACTURER'S normally-open device. LinkGate's simple yet advanced EncRadio transmitter system features coded digital transmission, giving you the ability to associate a bib number with a start impulse before the competitor leaves the gate! Oversize buttons are easily pressed even with ski gloves on. EncRadio's LinkGate can be used with photocells, startgates, and in combination with the Racetime2 and REI2 timers and also allows remote control of the µTAB alphanumeric scoreboards and the µGRAPH graphic scoreboards. Thanks to Microgate's longstanding partnership with Lynx System Developers, the LinkGate can be used with the FinishLynx photofinish system. Only available in a 10mw version, the DecRadio Light is the receiver designed to work with the Polifemo Radio photocell. It is ideally suited for portable training such as skiing. Powered by internal rechargeable lithium batteries, EncRadio transmitters feature LCD display for entry of bib number, DecRadio receivers are powered by the timer they are connected to.